Testing your pool water for the first time? It can feel intimidating, especially if you never had a good chemistry teacher to build up your science confidence. But don’t worry! At River Pools, we know pools, and we’re here to help. What do I test the pool water for? pH is how we measure how acidic or basic/alkaline the pool water is. 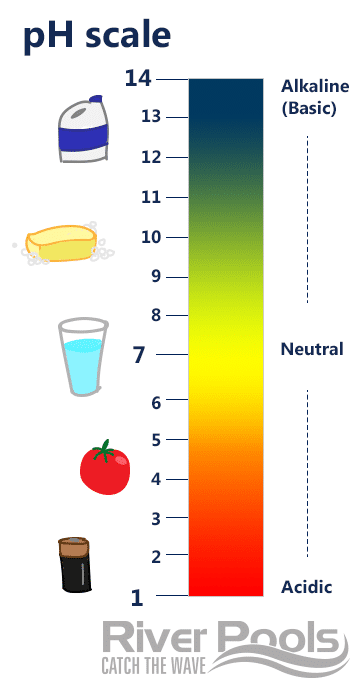 The scale ranges from 1 (super acidic) to 14 (super basic). Pure water is right in the middle, at 7. Why is incorrect pH bad for your pool? Whether too high or too low, improper pH levels can damage your pool and its equipment. Yes, pH measures how acidic vs. alkaline the water is. However, total alkalinity is a different beast, and you measure it separately. Total alkalinity measures all alkaline substances in the water—specifically carbonates, bicarbonates, and hydroxides—that can stabilize the pH. In effect, it measures how well the water resists change in pH. Note: total alkalinity is measured in ppm (parts per million), not pH levels. Why is incorrect total alkalinity bad for your pool? When your total alkalinity is too low, the water pH will change too easily. When your total alkalinity is too high, the water pH will be super difficult to adjust. Concrete pools in particular have issues with pH and total alkalinity because the plaster surface is alkaline itself, and therefore it adds to the total alkalinity. For comparison, the gelcoat surface of a fiberglass pool doesn't affect the pH or the total alkalinity, making it much easier to maintain. And most of the time, it’s not 100% chlorine. It’s in a compound with other elements (like lithium or sodium) because 100% chlorine is a gas that could kill you if you don’t handle it exactly right. Safety first, my friends. Fun fact: hypochlorous acid (HOCl or HClO) is the chlorine compound that actually kills algae and destroys germs. When you test the pool water’s chlorine levels, you’re actually testing for the levels of “leftover” hypochlorous acid—how much is still floating around after it’s done its job. We pool people call it free chlorine because it’s free in the water, just living its life. Another option for chlorine is salt chlorine generators. You add salt to the pool water instead of chlorine, and the generator converts it to chlorine. Saltwater pools stay clear, feel silky, and are easy to maintain. They work best with fiberglass pools because there are no metal wall panels that could rust and no plaster that could wear away. Caution: because saltwater pools are so clean and clear, it's easy to forget about testing the water. If neglected, the chlorine levels can double or triple without you noticing. This is, as we say in the pool science business, not good. Why are incorrect chlorine levels bad for your pool? Too much chlorine can fade the pool (especially the liner of a vinyl liner pool), irritate your skin and eyes, corrode the pool equipment, and lower the water pH. Too little chlorine creates a cesspool of bacteria and dirt. This would be as gross as the word "cesspool." Cyanuric acid, sometimes called CYA, acts like sunscreen for the pool chlorine. As a stabilizer, it provides a buffer so that the UV light from the sun doesn’t leach the chlorine from the water. Why are incorrect CYA levels bad for your pool? If your pool water has too little CYA, your chlorine levels will likely be low as well because they are vulnerable to those mean sunrays. If you have too much CYA, your chlorine will be less effective. It could also throw the pH test off, which is no good. Plus, the only way to lower it is to dilute the pool water. Calcium hardness measures how hard or soft the pool water is—how much calcium is dissolved in it. Why is incorrect calcium hardness bad for your pool? If the water is too soft (i.e., too little calcium), it will look for calcium on its own by eroding plaster, tile grout, etc. Concrete pools especially fall prey to this erosion and pitting. If the water is too hard (i.e., too much calcium), that extra calcium will cloud the water and solidify on the pool walls and equipment, which we call scaling. What’s the ideal range for pool water chemistry levels? If the levels fall outside these ranges, you risk damaging the pool and incurring both expensive repairs and lost swim time. How do I test my pool water chemistry? What do you use to test the pool water chemistry? You can dip litmus test strips into the water and compare the color to the chart—it’s fast, simple, and inexpensive. However, this method is the least accurate option. 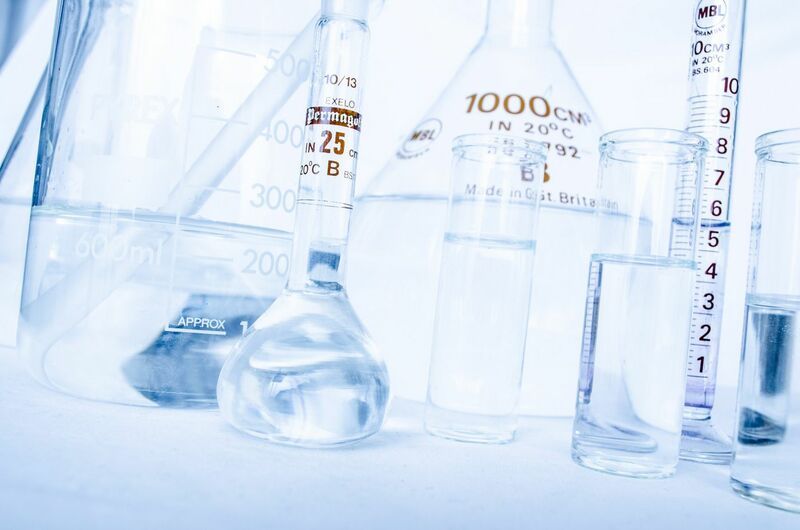 Liquid (titration) testing kits provide more accurate and more thorough results. Their price does rise accordingly. Digital pool testers sometimes look like thermometers. They provide the fastest and most accurate results because they’re, well, digital. No (potentially faulty) human interpretation required. They’re also the best option for pool owners who have trouble distinguishing colors. For obvious reasons, though, they are the most expensive method for pool testing. Whatever tool you choose, test the pool water every week. Each level affects the others, so if you test and adjust water chemistry levels out of order, you'll have to backtrack and fix the levels multiple times. What's the easiest pool type for maintaining the water chemistry? Each pool type—concrete, vinyl liner, and fiberglass—has its own pros and cons. Concrete pools look classic but are the most difficult type of pool to maintain because of how alkaline and porous the surface is. The water chemistry can easily get out of whack, and algae sets in. They also require acid washing every 3–5 years, resurfacing every 10–15 years, and (for most people) a professional cleaning each season. Vinyl liner pools don't have so much trouble with the water chemistry, but they have a different set of issues: you need to replace the liner every 5–9 years. The gelcoat surface of a fiberglass pool is inert: it doesn’t affect the water pH. You still need to test your water chemistry each week, but you’ll rarely need to add acid to balance the water. And as long as the pool is well manufactured and well maintained, there won't be any required maintenance to the pool shell for many decades. 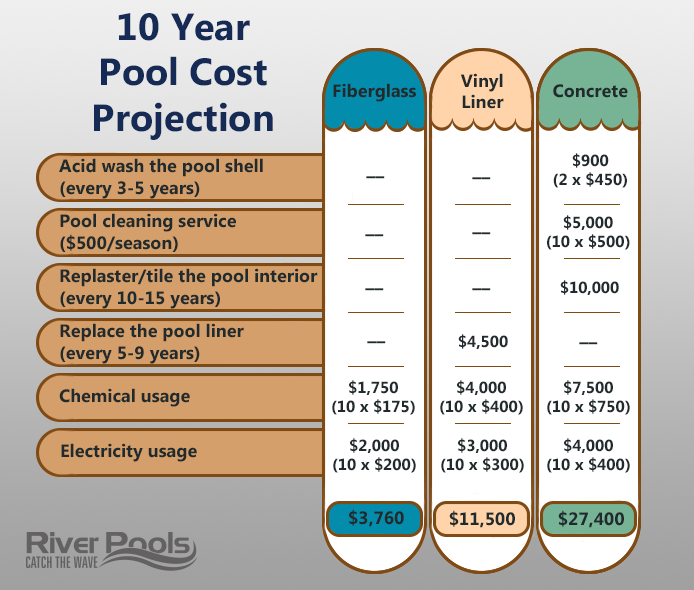 Of all 3 pool types, fiberglass pools require the least maintenance over the life of the pool. They cost $45,000–$85,000 upfront, but they have incredibly low lifetime expenses, which saves you money in the long run. River Pools manufactures and installs fiberglass pools in Virginia and Maryland. We also operate in other areas of the country through our network of nationwide dealers. If you’d like to learn more about the different types of pools, check out our comprehensive ebook "Comparing Fiberglass, Concrete, and Vinyl Liner Pools in the Modern Age.” It discusses cost, design, durability, installation, and more—everything you need to make a big pool decision. Take a look at our complete guide to pool maintenance. Let us help you make the most of your pool!